Sluuuuurrrrp. Forkin’ drop that cutlery and prepare to (chop)stick it to hunger! Annerley’s latest and greatest is the marvellously-named pho and dessert bar, Pho Queue. The latest masterpiece from the family behind Café O’Mai and Red Lotus, Pho Queue is a tribute to pho-bulous Vietnamese flavours and French-inspired pastries. Feast on oodles of noodles and lashings of broth in bowls bigger than your own head; then top off the visit with an array of tempting tarts and croissants. One thing’s pho sure – you won’t be leaving hungry. The souper team at Annerley have brought five pho varieties to the table, ranging from the Hanoi-style beef pho, a northern Vietnamese style we’ll all find familiar, and a Southern style boasting broader spice offerings. Not broth-ered by the normal varieties? Bowl over your expectations with free range chicken, vegan mushroom, or a zero sugar option. Un. Phocking. Believable. For the more adventurous souperstars, try branching out with dishes from the Soup Collection, with fare like their clear egg noodle soup with liver, quail egg, squid and pork. Seafood lovers will be tempted to try the Bun Rieu swimmer crab and tomato soup, with added crab balls and pond snails. Keen to spice it up? 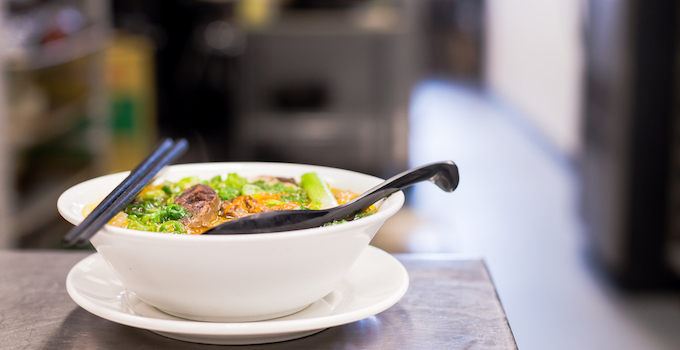 Nab the fiery Hue spicy beef and pork noodle soup! We know it’s nearly impossible, but try to save room for dessert. Pho Queue sweetens the deal with arrays of delicious pastries, palate-cleansing bubble milk tea, lemongrass iced tea, and their legendary Vietnamese coffee. Pho-get your ordinary cup-o’-soup– head to Pho Queue and feast on pho ‘til you’re too full to move! Words by Samantha Chariton and Kat Gridley – the gourmands who know pho sure what they want to eat!